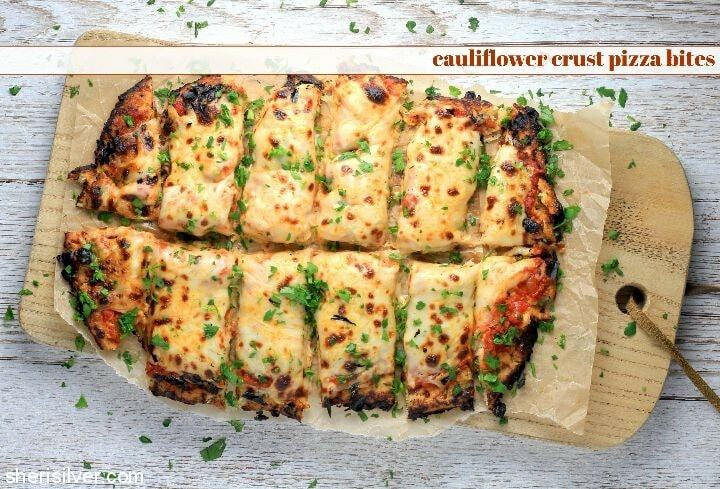 The “cauliflower crust” trend was one that – until recently – I managed to resist. I mean……..really? Cauliflower? As a crust? But as we’ve gone more and more gluten-free these days it was hard to deny the appeal (assuming this would actually work) of a GF base for my beloved pizza. And when I came across a delish looking recipe on the fab Gimme Delicious blog, I decided it was time to try. Layla creates real-life recipes that are beautifully photographed, so if anyone was going to make this work it was her. And OMG it couldn’t be any easier, too. 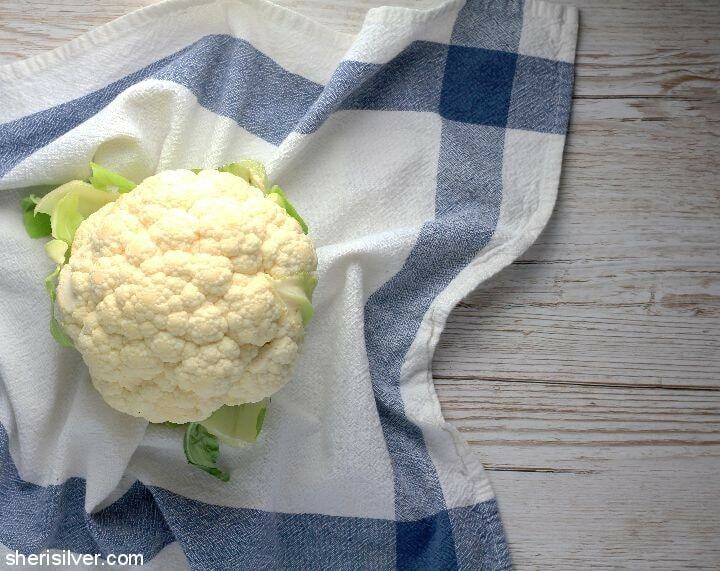 Simply process the cauliflower, quickly microwave and squeeze out the excess moisture. Add cheeses, an egg and some seasonings, pat into a crust shape and bake. By no means was this a thick, doughy crust but rather more like a flatbread texture. Which, all told, was fine with me. Needless to say this is infinitely adaptable, so feel free to experiment with different cheeses, spices, and of course toppings! Have you jumped on the bandwagon yet? Any tips, trips or recipes you love? Share here! Pre-heat oven to 500 degrees; line a baking sheet with lightly oiled aluminum foil. 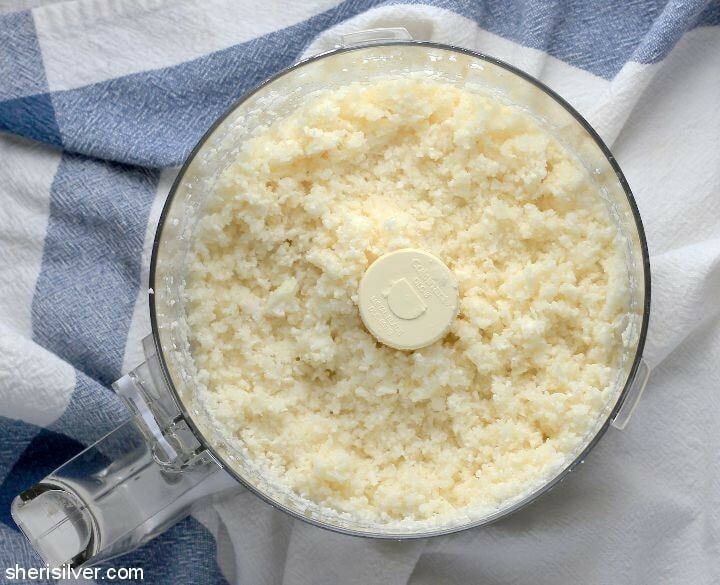 Place the cauliflower in your food processor and process till finely chopped (you can also use the small hole side of a box grater). Transfer to a bowl and microwave for 4-5 minutes; let sit till cool enough to handle. Transfer to a clean dish towel and squeeze out as much liquid as possible. 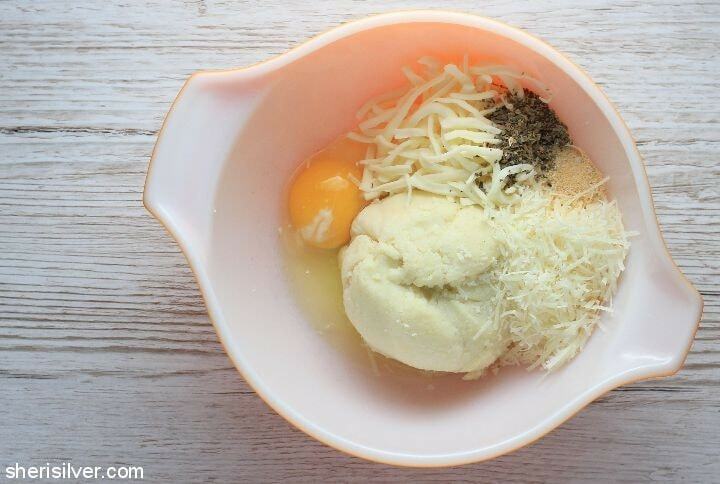 Return to the bowl and add the egg, parmesan, 1/2 cup mozzarella, spices and salt and pepper. Stir to combine and pat the mixture onto your prepared baking sheet, into whatever crust shape you like. Bake for 15 minutes or till golden brown. 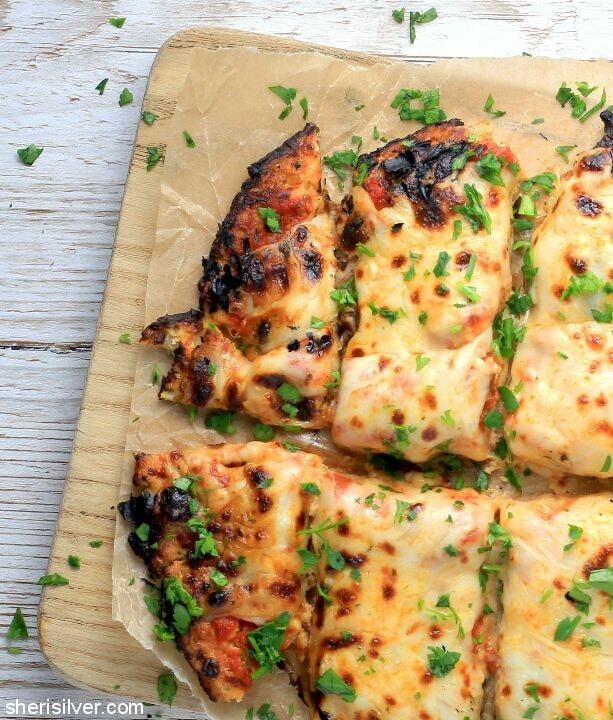 Turn the oven up to broil, remove the pan and top the pizza with the marinara and remaining mozzarella. Return to oven and broil till cheese is melted and bubbly. Sprinkle with chopped herbs (if using) and serve hot. More gluten-free and snack ideas on Pinterest! I’d say you did a pretty good job of talking it up and taking pictures too Sheri. I may have to try too. Although I’m also thinking all this cheese doesn’t make it low cal! Ha! Not Gluten Free and not cauliflower rice but never less, an amazing dish I have made many times: NYT cauliflower al forno. It’s a crowd pleaser!! 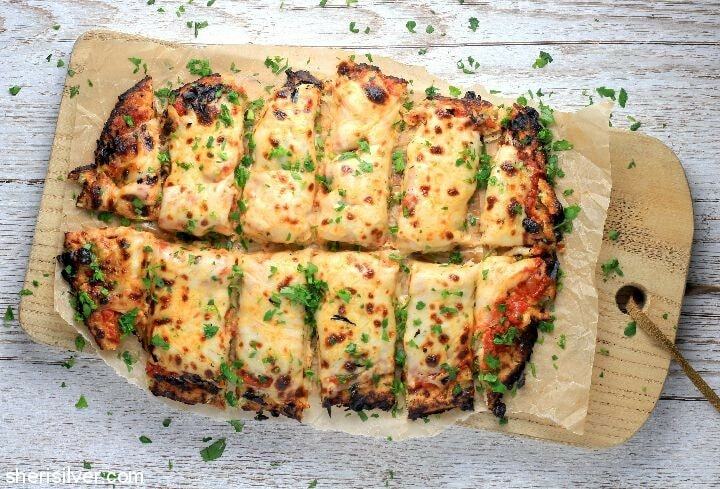 Also make it as a side dish without the pasta and cheese!! Check it out! Oh I am ON IT.